It’s Throwback Thursday so let’s go back through Upper Deck’s trading card history and come up with a fun giveaway. The 2014 NBA Playoffs are in full swing and LaMarcus Aldridge of the Portland Trail Blazers is making his presence known! Aldridge knocked down 43 points in Game 2, right after his impressive 46 points in Game 1 versus the Houston Rockets. LaMarcus Aldridge has joined Michael Jordan and Tracy McGrady as the only players to go for 40+ points in Games 1 and 2 on the road. So let’s put up a throwback card and see if our fans can come up with some great captions for the card! Please share your comical caption to this card for your opportunity to score five (5) packs of 2013-14 Fleer Retro Basketball! You have until Friday morning, April 25 at 8:00 a.m. PT to post your caption before this promotion is closed. As R. Kelly once said: I believe I can dunk, with a little bit of luck and a sucked in gut, I believe I can dunk. Replace with fly where required. Whoops….This is a little too high up. I hope they have a step ladder to get me down. 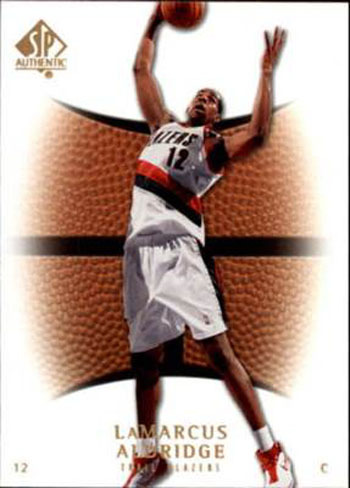 Lamarcus Aldridge reacts to being named Upper Deck’s Throwback Thursday subject! reaching the rafters is like so awesome. Look up there! Is that Buzz Aldrin Or Buzz Aldridge? Man do the Bulls going to regret trading me for Tyrus Thomas! Oh, no!!!! I’m being sucked into another dimension filled with tv’s that just play “Celtic Pride” over and over again on a loop…..HELP MEEEEE!!! Ahhh i thought i could fly! Should have listened when they said not to try the Fizzy Lifting Drink! What?! I SWEAR there was a hoop here just a second ago!! I bet if I block my own shot, I will confuse the hell out of everybody! I am THE BEST at ballerina. What! Mom said picture day wasn’t until tomorrow!!! Oh snap! We’re playing basketball?! and reach 2, 3, 4… C’mon guys, lets stretch it out now! Someone please, please tell me why my name is on my leg??? I got the whole world in my hands! No wonder why I have 42, there is no one else on the court!! Dang Damian, this ain’t football, this is BASKETBALL! 3…2…1… Blast off! Time to rock the Earth with this dunk! Hey mom! LOOK AT WHAT I CAN DO! Oh my gosh….oh my gosh…..oh my osh……I GOT THE BALL!…… NOW WHAT?!?! It’s fun to stay at the Y M C A. These Air Jordan’s really elevate my game! Mom!…LaMarcus got into the catnip again! Hey upper deck you guys get it? Man I’m getting tired of posing like this and my leg is starting to cramp! Help!!! Someone get this giant basketball off my back!!! Coach said if I get 17 boards he will order post game pizza. There is 17! Congrats to Larry Mohler! Your creative comment has scored you five (5) packs of 2013-14 Fleer Retro Basketball! Thanks to everyone for participating and we hope to see your comical captions next week. LaMarcus is a huge Ohio State fan as he demonstrates his O H I O dance, pictured here doing the ‘H’…. Go Bucks!!! !